SAS is a software that is mainly intended for statistical analysis, its purpose is to manage and analyze the data that have been collected, you can get to know how the application works and is organized. This statistical software is designed to overcome the programming efforts; it can be used for accessing, analyzing, managing and reporting data. It is used to input the data into applications, retrieval and managing the data. Helps in creating the report and graphic designs. It provides a solution for the business by giving them business forecasting which helps in the important business decision. So if you are looking for a job that is related to the SAS System, you need to prepare for the SAS System Interview questions. Though every interview is different and the scope of a job is also different, we can help you out with the top SAS System Interview Questions and answers, which will help you take the leap and get you success in your interview. 1. Mention some of the SAS products that are available in the market? There are many other products available that are helpful in spreadsheets, to access the database and can connect to other machines where SAS is running. 2. Explain what is Data Step and Program Step in SAS programs? Data Step and Procedure Step are the main components of the SAS program. Data Step: It reads data from other sources, recovers, manipulates and integrate with other data and create reports. This step will prepare the data for use by one of the procedures called “procs”. Procedure Step: It interprets the data and will perform analysis and outputs huge volume of data and procedures to handle it. 3. How can you access SAS using a UNIX system? Type sas: It opens the Display manager consisting of program, log and output window. There are some procedures which should be run in Display Manger. Type sas –nodms: It will be prompted at each step of SAS statement and output will display on the screen. Type sas –stdio: It will behave like a standard UNIX program, take the input from standard input, sends the log to standard error, and provides the output vis standard output. Type sas filename.sas: This is a batch mode, from filename.sas it reads program, saves the log in filename.log and output will go to filename.lst. Let us move to the next SAS System Interview Questions. 4. How can you minimize the space requirement in SAS? When there is a huge volume of data, you need to split the large data sets into smaller data sets. In each step, you need to make sure all the unwanted data must be deleted. You can limit the data to variables using various data set options or statements. In order to limit the number of observation, you can use If or OBS= statements. You can optimize the WHERE expression and limit the number of observations in Data Step and Procedure Step by using WHERE or WHERE= or index Statements. Bytes of a variable can be limited by using length. When there is no need to create the data set you can make use of Use_null_data set name. You can also compress data sets by using data set options like COMPRESS= or COMPRESS=binary or any other system options. You can use SQL statements for many options rather using Data Step and Procedure step with temporary data sets. 5. Explain the important features of SAS? Analytics: It provides business analytics for companies; it provides analytics to many business products and services. Data Accessing and Management: It can also be used as a database management system where it can access the data from many sources and manages it. Reporting and Graphics: SAS provides important information about the company through quality graphical reports. Visualization: The reports provided by SIS can be in the form of graphs and various attractive visualization that make it easy to understand. Business Solutions: The data generated and stored by the company will be analyzed and get useful information that will help a company to take better decisions for complex Business solutions. 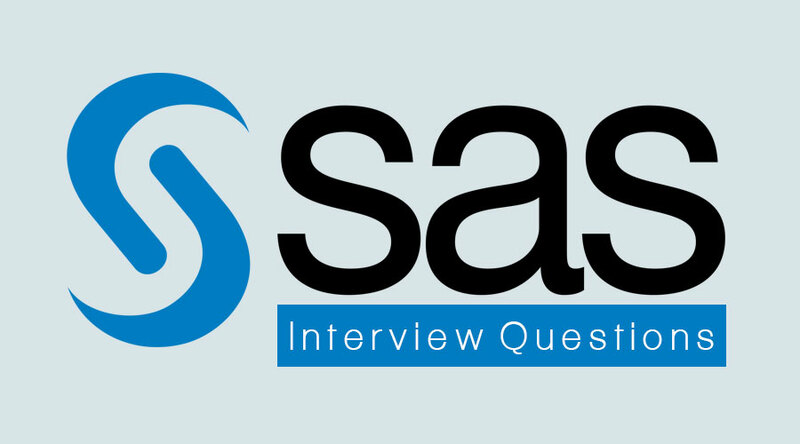 Let us now have a look at the advanced SAS System Interview Questions. 6. What happens when you execute PROC SQL in SAS? First, it checks for the syntax error such as semicolon, missing or invalid statement by checking each statement in SQL procedure. Then SQL optimizer will scan the query statement to decide how the SQL query should be executed to reduce the runtime. Next, it will load the tables mentioned in the FROM statement to the data engine, where data can be accessed from memory. Code and mathematical calculation are then executed. The final table will be created in the memory. At last final table is sent to the output table as described in the SQL statement. 7. What are the common programming mistakes done in SAS application? Systematic execution: SAS executes Data or Proc steps one at a time, any program cannot mix and match the other steps. It generates the error saying that the assignment statement is invalid. Missing Semicolon: If a semicolon is missing then it sends an error message saying that the ELSE statement has no matching IF or THEN statement. The missing semicolon will cause SAS to read the two statements as a single statement. Length or Variable: Based on the first mention on the variable the Data Step will assign the length for a variable. If it is not matched then it does not send an error message instead it takes the length of the previous variable mentioned. So you should be more careful when assigning a length to a variable. Missing value: This error occurs when there is s missing value in a statement, this does not give out any error message but the program will run for a long time without executing. 8. What is PDV in SAS? What are its functions? Program Data Vector will be created once the input buffer is created at the time of compilation for holding the records from an external file. PDV is a type of memory where it creates the data set one observation at a time. Before the PDV is created, the input buffer will be created during the compilation to hold the records from external files. PDV will be created after the creation of Input buffer. Then SAS will create the data sets to store it in the logical memory. 9. Explain regarding Multiple Datasets in SAS? One of the greatest advantages of SAS is its ability to handle Multiple Data Sets at a time. The main statements used to do this are the set, merge and update, along with first and last Variable. Observes the Datasets and concatenate data sets rows to form one large dataset. Getting together multiple data sets based on the single variable value. And more complex merging techniques. 10. When do we use PROC MEANS and PROC FREQ? PROC MEANS: It is used when you are handling numeric variable. PROC FREQ: It is used when you are handling the categorical variable.